At every Greenville Symphony Masterworks concert, one piece is always on the program: the National Anthem. Conductor Edvard Tchivzhel insists on it. It’s his way of paying tribute to his beloved adopted country, a nation that saved his family from a “totalitarian” Soviet Union. Sometimes, as he leads the audience in singing, Tchivzhel can’t help but think also of his grandfather, the one he never met: the grandfather who was murdered by Joseph Stalin’s henchmen. Tchivzhel, the Greenville Symphony’s dynamic music director, is celebrating the 25th anniversary of his defection from the Soviet Union. This weekend, he’ll lead a program at the Peace Center that honors his past and present, with Tchaikovsky’s Third Symphony balanced by the works of two Americans, Gershwin and Copland. The scene will be one that has been repeated more than 100 times since Tchivzhel started the tradition after the terrorist attacks on Sept. 11, 2001. He’ll march briskly to the podium, signal a snare drum roll and turn to the audience, coaxing everyone into a huge sing-along. The audience will no doubt respond enthusiastically to Tchivzhel’s commanding leadership, becoming an impromptu chorus, with many hands on hearts. It’s always a warm moment of community music-making and shared patriotism. For Tchivzhel, those two minutes out of a typical two-hour concert are rich with emotion and meaning. Life in the repressive Soviet Union, by contrast, was like a “prison,” Tchivzhel said. “In the Soviet Union, you were not the master of your own life,” said Tchivzhel, who 25 years ago was associate conductor of the legendary USSR State Symphony Orchestra. Tchivzhel’s antipathy toward the Soviet regime has deep roots in a family tragedy. In 1937, his grandfather, Alexander Tchivzhel, was arrested on trumped up charges by KGB agents. They never saw him again. It was only in 1954 that Tchivzhel’s family learned of Alexander Tchivzhel’s fate: After being arrested, he had almost immediately been executed, probably by a firing squad. Tchivzhel, as a young man, nurtured an intense desire to escape from his bleak and dispiriting homeland. “When I grew up, began my career and traveled abroad, I swore to God that I would leave this damn Soviet Union,” Tchivzhel said. When Tchivzhel had a chance to bolt in 1991, he took it, despite considerable risks. The story of Tchivzhel’s escape may seem like the plot of a spellbinding Cold War novel by John Le Carre, filled with KGB spying, clandestine phone calls and a hairbreadth escape to freedom. It all began, ironically enough, at Chuck E. Cheese’s in Greenville. It was 25 years ago in January that Tchivzhel came to Greenville with the USSR State Symphony to perform in a sparkling new performance hall called the Peace Center. Tchivzhel alternated conducting duties with Yevgeny Svetlanov, a towering figure in classical music. Svetlanov conducted at the Peace Center. Tchivzhel’s wife, Luba, and their son Arvid, then 4 years old, also were traveling with the orchestra during its month-long U.S. tour. At dinner in Greenville the night before the concert here, Tchivzhel whispered to translator Lena Forster, then general manager of Greenville Ballet, that he wanted to defect from the Soviet Union. Forster, a mother of three children, had taken the Tchivzhels to Chuck E. Cheese’s. Earlier, she had introduced them to the wonders of American abundance by taking them to Wal-Mart. She took the message to the late local attorney Larry Estridge, then with the Wyche law firm. “I thought of Larry because I had known him for a long time and had great respect for him,” Forster said. But Estridge, a commercial real estate lawyer, had never worked on a political asylum case. Forster suggested the two were the perfect pair to fool KGB agents. Estridge, who died in October, 2015, spoke to this reporter in 2011 about Tchivzhel’s defection. Weeks of secret late-night conversations followed as Tchivzhel toured the U.S. with the USSR Orchestra and Estridge prepared the legal papers necessary for the Tchivzhels to gain political asylum. “We were able to work our way through the regulations and determine that they were entitled to refugee status and ultimately citizenship,” Estridge said in 2011. To evade the watchful gaze of armed KGB agents on tour with the orchestra, Tchivzhel, on his nightly jog, called Forster from pay phones. The saga culminated in a Washington, D.C., airport on Feb. 10, 1991, with Forster and her brother assisting the FBI. Having just arrived after the orchestra’s Long Island concert, Tchivzhel and family were to be spirited away by six FBI agents in a caravan of three cars, destined for a new life in the U.S. But Tchivzhel, against the wishes of the FBI, first said goodbye to the musicians of the Soviet orchestra, creating a moment of panic. The FBI had carefully planned the Tchivzhels’ escape. One entire lane from the airport had been closed for a quick getaway. Nevertheless, Soviet Embassy officials jumped into a car and chased the FBI caravan. On the spur of the moment, the FBI agents decided not to travel to a Washington, D.C., immigration office but rather to one in Baltimore. The Soviets trailed the caravan all the way to the Baltimore office. Once there, an FBI agent ordered the Soviet officials to leave official government property. It worked. “We had an angel watching over us,” said Forster, now executive director of Greenville’s International Ballet. Following some paperwork, Tchivzhel and his family boarded a plane for Greenville. Tchivzhel gained his freedom. Greenville gained a first-rate conductor. America gained a dedicated new patriot. Coming from the Soviet Union, Tchivzhel said he felt “very lucky and proud to start a new life in a place of freedom and liberty. When he arrived in Greenville after his defection, Tchivzhel’s first act was a very American one: He held a press conference, organized by Estridge. 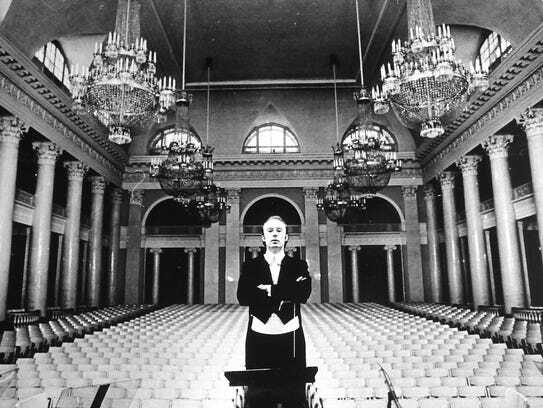 The news of a conductor turning his back on the Soviet Union garnered national and international attention. But there was a steep price to pay. Tchivzhel never saw his mother again. She died in 1994. He saw his father only once more when the latter journeyed in 1995 to see his son in the United States. “We had a nice reunion but then he left and I never saw him again as well,” Tchivzhel said. Tchivzhel’s defection took place in the context of a crumbling Soviet Union. By December of 1991, all 15 republics of the Soviet Union had gained independence, marking a formal end to the world’s largest socialist state and the conclusion to the final chapter of the Cold War. In his first months in the United States, Tchivzhel, his wife Luba and son Arvid lived with Forster’s family, who along with other Greenville residents helped the newcomers adjust to life in the U.S.
“I taught Edvard to drive,” Forster said. Greenville residents even held fundraisers for the Tchivzhels. Tchivzhel later became conductor of the Fort Wayne (Indiana) Symphony Orchestra. As he continued to develop his conducting career in the U.S. and internationally, Tchivzhel returned to Greenville several times. He was appointed conductor and music director of the Greenville Symphony Orchestra in 1999. That same year, Tchivzhel was granted American citizenship. He also was appointed a visiting professor of conducting at Furman University. Tchivzhel, a serious musician with a droll sense of humor, soon learned to say “Y’all” in a thick Slavic accent when addressing Greenville audiences at the Peace Center. But it was a national tragedy, the Sept. 11 attacks on the nation, that inspired Tchivzhel to begin every Masterworks concert with the National Anthem. Nationwide, few orchestras begin concerts with the National Anthem. Here in Greenville, the 15-year musical tradition Tchivzhel established shows no sign of being discontinued. Arvid Tchivzhel, for his part, graduated from Furman University and now works for an economics consulting firm in Atlanta. He’ll join his father at this weekend’s concerts, orchestra officials said. Classical music fans in Greenville said Edvard Tchivzhel has been an outstanding leader for the orchestra, substantially boosting attendance at concerts. Bob Howard, who arrived at the Greenville Symphony to handle administrative duties at about the same time that Tchivzhel became music director, said he learned Tchivzhel’s musical philosophy early in his tenure. With an energetic podium presence and a keen sense of musical drama, Tchivzhel demands high standards of music-making from the orchestra and challenges the musicians to test the limits of their abilities, orchestra members have said. Sherwood Mobley, the orchestra’s executive director who died early this year, spoke to this reporter in 2015 about Tchivzhel: “He has raised the level of artistry significantly since he came on board. He’s a consummate professional, with a very strong attention to detail. “He’s definitely an inspirational figure, and passionate about music-making,” he added. For the latest in local arts news and reviews, follow Paul Hyde on Facebook and Twitter: @PaulHyde7.